Sedona was to be a real unknown for us since we were headed there with no reservations or plan at all. I hoped to score a first come, first serve campground site just south of town, but our phone inquiries were not reassuring. Undeterred we pressed on, and since we were already completely winging it, upon passing signs for Meteor Crater, we felt free enough to spontaneously turn off on the exit and drive the six miles to the crater. Very difficult to capture the entire crater from the rim. 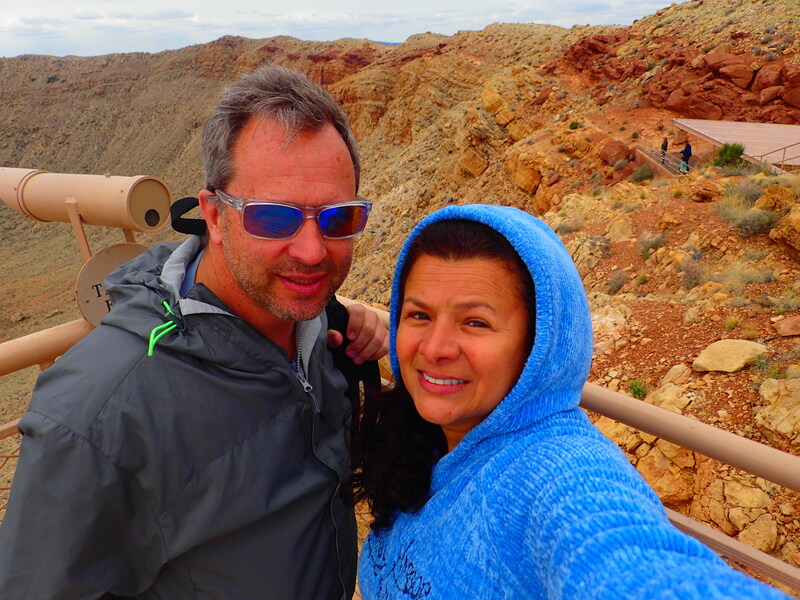 It was pretty astounding; the worlds best preserved major meteor crater, nearly a mile across, resulting from the collision of a nickel iron meteor 150 feet across about 50,000 years ago. 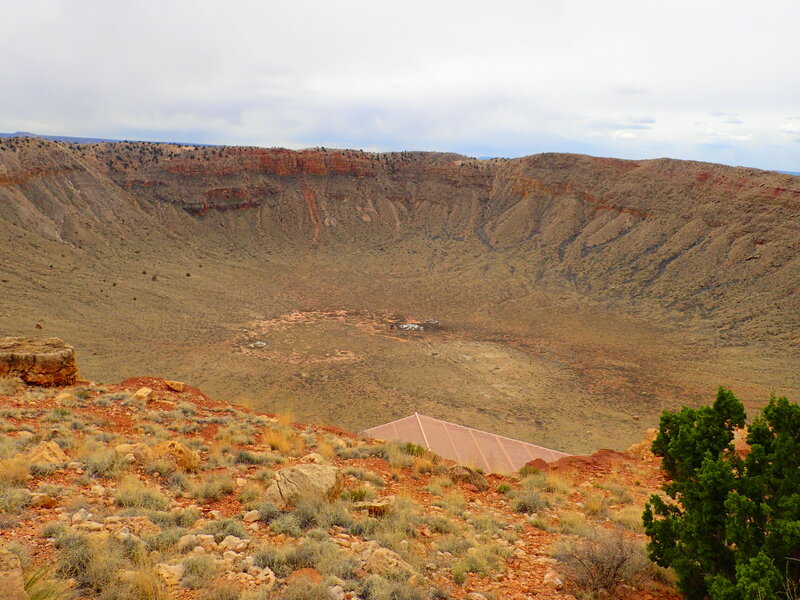 The crater is on private land, so our National Park pass didn’t help at all. The entry fee was a bit steeper than we hoped, $16 per person after the $2 discount for retired military, but they do a nice job of providing multiple look out points with mounted telescopes and the short movie in the museum is high quality and very informative. All in all it was a nice two-hour diversion. We pressed on towards Flagstaff with The Big Kahuna complaining about the elevation increase for much of the journey; once again we were frequently down to 28 mph in first gear while watching the oil temperature climb up to 230 degrees from the normal 180. Whatever complaints we have about going uphill would soon be utterly eclipsed by the terrifying down hill run into Sedona. Seriously, they didn’t call it Death Highway or Screaming Twisty Downhill Road, they named it innocuously State Route 89A. Soon after leaving I-40, and without warning, we hit major elevation changes and grades leading directly into cliff side hairpin turns. It was not the turn radius that concerned me, it was my rapidly overheating breaks while I tried to keep my speed down leading into those turns. In addition to overheating, since the brakes are compressed air activated and I was using them so often, my compressor was losing the battle in keeping up with the air demands. Fortunately when the low pressure alarm started screaming we were already near the bottom. On two occasions I had to use the emergency hand brake to feel comfortable heading into a couple of hairpins, and a third time when one of those Cruise America RVs backed out from the side road in front of me at the steepest part of a downhill run. Idiot. We survived without hitting anything, but it was a major wake up call on the need to check the elevation changes for some of these roads before risking them with our ludicrously heavy bus running on decades old brake and drive train technology. More on Sedona next post. Guys, seriously, you might want to visit http://mountaindirectory.com/ and check it out. Your post brought back some memories of our trips out west in our old 4104, before we got a Jake brake… we used every single damn pull-off to let things cool down (brakes going down, engine going up. A friend of ours showed us the Mountain Directory and we found it very helpful. Love your pictures! OH thanks for that! I will definately be checking it out.